Encountering Christ in His Word is an important aspect of our practice of the Faith. On Friday afternoons you’re invited to come along to study and pray with the preceding Sunday’s Gospel. Begins at 3.00 pm in the Presbytery. All welcome. This publication - a very useful one to help you foster daily prayer - is available to purchase from the back of church. Very reasonably priced at £2.25. Leaflets about the forthcoming Holy Year will be distributed this weekend which will explain what the Year of Mercy will mean in our lives for the next 12 months. The Bishop has asked that both churches send two representatives to inaugural events in the diocese at Lancaster on Tuesday 8th December at 7.00 pm [Mass of Inauguration] and on Sunday 13th December at 6.30 pm [opening of the Holy Door]. If you would like to represent the parish, please let Fr. Michael know. During the Year of Mercy there will be additional opportunities for the Sacrament of Reconciliation since it is in this sacrament that we truly experience the mercy of God. Focus will be given on the corporal and spiritual works of mercy and the Year of Mercy will be an underlying theme for future Faith on Tap talks. The Holy Year of Mercy will be inaugurated in the parish on Tuesday 8th December with a Mass of Anointing for the Sick and Housebound. Organised by Christ the King SVP, the Mass will be celebrated at 2.00 pm followed by refreshments in Harraby Catholic Club. Fr. John Millar [of Our Lady of Eden parish] is organising an Advent Day of Recollection on Saturday 19th December. The recollection will begin at 9.00 am and conclude at Noon. If you would be interested in attending, please contact Fr Millar 521509 or email: ourladyofeden@gmail.com. There will be a whole school Mass on the morning of Wednesday 9th December at St. Margaret Mary to inaugurate the Year of Mercy in our parish school. This will take place at St. Margaret Mary on the afternoon of Wednesday 9th December. More details to follow. 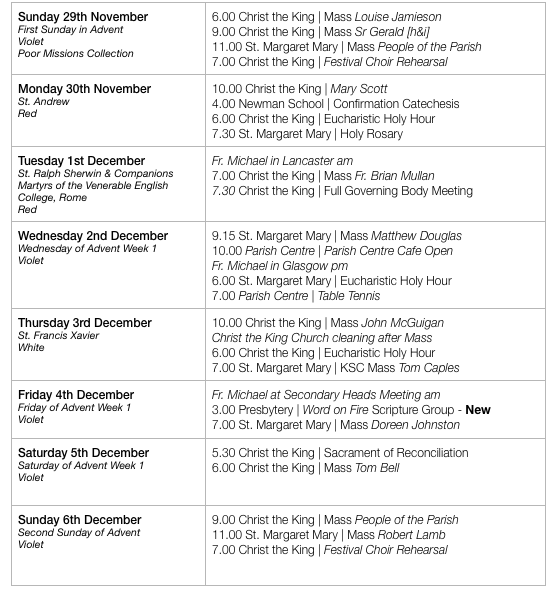 The Christmas Tree Festival will be taking place from Friday 11th to Sunday 13th December at Christ the King Church. We are looking for volunteers to help with welcoming and refreshments during the weekend. Sign up forms are available in church. The Knights of St. Columba are organising a Family Quiz night on Friday 11th December from 7.30 pm - 10.00 pm in the Parish Centre. For more information, please email: ksccouncil60@gmail.com or contact Paul Lovell. Many thanks for your offering of £700.15 last weekend. There were 229 at church over the weekend. Please continue to support this worthy initiative via the basket in the porch at Christ the King. Any pre-decimal or unwanted foreign coins can be placed in the SVP box at Christ the King. Our Carol Service is taking place on Sunday 13th December at 6.00 pm in Christ The King Church. 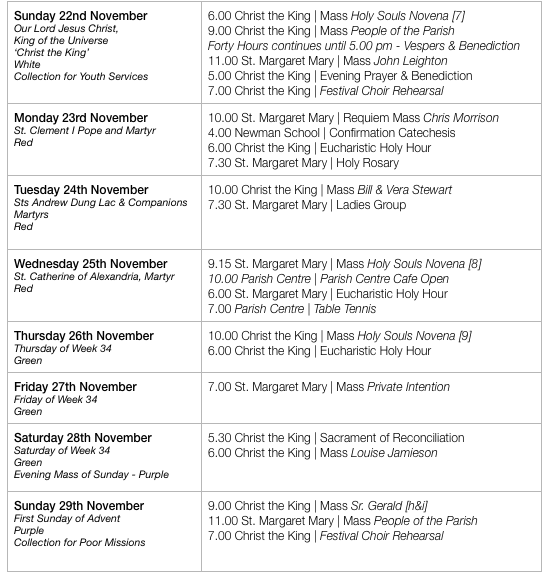 Rehearsals begin on Sunday evenings from Sunday 8th November at Christ The King. All are welcome to join us especially new members. First Holy Communion will be celebrated in the parish on Sunday 5th June 2016. There will be an initial meeting for parents on Thursday 21st January 2016 and preparation of candidates will begin on Thursday 4th February. Regular attendance at Sunday Mass is an essential part of the preparation. Saturday 19th December @ 7.00 pm in the Parish Centre. 3 course meal, choice of menu, £15 per person - open to all. If interested, please pre-order your choice by emailing: pauldlovell@aol.com and requesting a menu. Parish Confirmation Catechesis takes place on Monday evenings at Newman School at 4.00 pm. We are now collecting for our local families in need for Christmas food parcels. We hope to deliver these by 17th December at the latest so please check best before dates. We will also continue to work with Carlisle Action for Calais and make up food packages. There are lists of suggested items on the tables in church at St. Margaret Mary. On Saturday 12th December at 7.30 pm at St. Margaret Mary’s, a concert of Christmas Music [St. Nicholas Mass & Carols]. Tickets £7.50 - school-age children free. Tickets may be obtained by ringing 01228 402012 or 016977746484 and from Judith after the 11.00 am Mass on Sundays. As part of this Holy Year, Bishop Campbell has dedicated Our Lady & St Joseph’s to be a shrine of Divine Mercy. He will inaugurate this shrine on Friday 11th December at 3.30 pm by celebrating Vespers, Divine Mercy Chaplet and Benediction. Refreshments will follow in the New Waterton Hall - provided by our own Parish Centre team. During the Holy Year of Mercy we are encouraged to make frequent use of the Sacrament of Confession - please consider going to confession at least once a month during the Holy Year. Additional opportunities to frequent this sacraments will be made available during the Holy Year. The Forty Hours will conclude on Sunday evening with Evening Prayer and Benediction at 5.00 pm. Leaflets about the forthcoming Holy Year will be distributed next weekend which will explain what the Year of Mercy will mean in our lives for the next 12 months. The Bishop has asked that both churches send two representatives to inaugural events in the diocese at Lancaster on Tuesday 8th December at 7.00 pm [Mass of Inauguration] and on Sunday 13th December at 6.30 pm [opening of the Holy Door]. If you would like to represent the parish, please let Fr. Michael know. During the Year of Mercy there will be additional opportunities for the Sacrament of Reconciliation, since it is in this sacrament that we truly experience the mercy of God. A ‘Word on Fire’ scripture study and prayer group will also be established in the parish - more information to follow. The Holy Year of Mercy will be inaugurated in the parish on Tuesday 8th December with a Mass of Anointing for the Sick and Housebound. Organised by Christ the King SVP the Mass will be celebrated at 2.00 pm followed by refreshments in Harraby Catholic Club. The Knights of St. Columba are organising a Family Quiz night on Friday 11th December from 7.30 pm - 10.00 pm in the Parish Centre. email ksccouncil60@gmail.com or contact Paul Lovell for more information. Many thanks for your offering of £647.08 last weekend. There were 256 at church over the weekend. Our Carol Service is taking place on Sunday 13th December at 6.00 pm in Christ The King Church. Rehearsals begin on Sunday evenings from Sunday 8th November at Christ The King. All are welcome to join us, especially new members. We are now collecting for our local families in need of Christmas food parcels. We hope to deliver these by 17th December at the latest so please check best before dates. We will also continue to work with Carlisle Action for Calais and make up food packages. There are lists of suggested items on the tables in church at St. Margaret Mary. On Saturday 12th December at 7.30 pm at St. Margaret Mary’s a concert of Christmas Music [St. Nicholas Mass & Carols]. Tickets £7.50 - school-age children free. Tickets may be obtained by ringing 01228 402012 or 016977746484 and from Judith after the 11.00 am Mass on Sundays. Monthly days of worship, prayer and praise. The next date is Saturday November 28th at St Edmund’s Church, Orton Rd, Carlisle. Our speaker will be Niklas Carlsson from Cor et lumen Christi. All welcome. Renewal days start at 11.00 am and finish at around 4.00 pm. Please join us even if you cannot stay for the full day. Tea and coffee provided, please bring a contribution to a shared lunch. Contact: Janice Wrench on 01768 868489. Will meet on Tuesday evening at 7.30 pm at St. Margaret Mary’s. The team will be making decorations in preparation for the parish Christmas Tree Festival. We have been informed that Bishop Michael Campbell will make a formal visitation of the parish on the weekend of 11th June 2016. There will be an informal meeting of anyone interesting in becoming a Catholic on Tuesday 17th November at 7.30 pm in the Presbytery at Christ the King. This week we welcome Fr. Marcus Holden who is travelling from Ramsgate in Kent to deliver this week’s Faith on Tap - ‘Arise once more! The renewal of Catholic England’. Fr. Holden has featured on a number of DVD’s and has featured on EWTN. He was the co-author of Evangelium and has written a number of books for the Catholic Truth Society. His multi-media presentation should be something to look forward to - the evening begins at 7.30 pm in the Parish Centre. Please come along! Faith on Tap will then take a break and resume in the new year. Thank you to all who’ve supported this initiative in the parish. 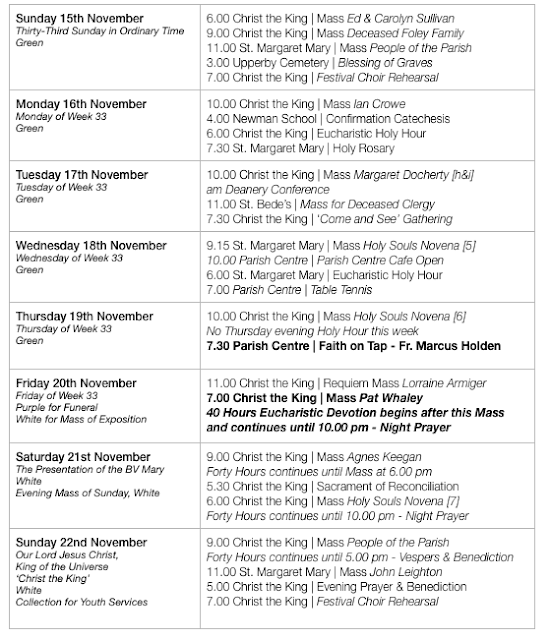 Next weekend we have an extended period of adoration which begins with Mass on Friday evening at Christ the King. It’s a wonderful grace-filled moment in the life of any parish to have such an opportunity to come and pray before our Eucharistic Lord. Make an effort to spend some time in prayer next weekend. The Forty Hours will conclude on Sunday evening with Evening Prayer and Benediction at 5.00 pm. Candle sponsorship forms are available. The annual Blessing of Graves at Upperby Cemetery will be held this Sunday [15th November] at 3.00 pm. A plenary indulgence is available every day during November under the usual conditions (confession, communion and prayer for the intentions of the Holy Father) by visiting a cemetery and praying for the dead. These indulgences can only be applied to the Holy Souls. Many thanks for your offering of £755.72 last weekend. There were 236 at church over the weekend. Our Carol Service is taking place on Sunday 13th December at 6.00 p.m. in Christ The King Church. 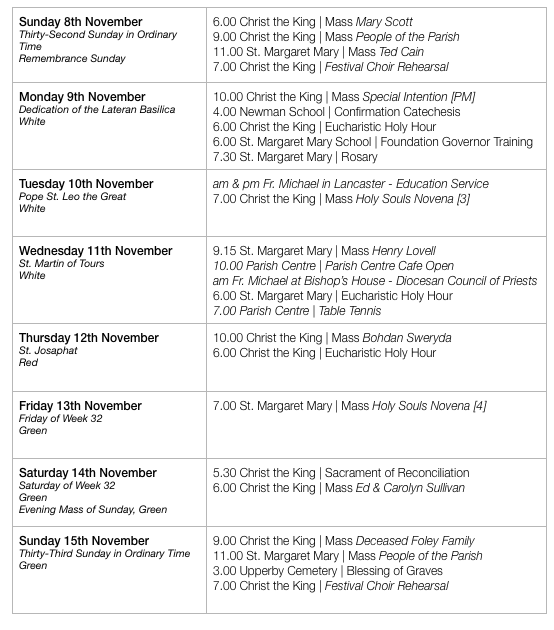 Rehearsals begin on Sunday evenings from Sunday 8th November at Christ The King. All are welcome to join us especially new members. Carlisle Keys which works with homeless and vulnerable young people would like donations of unwanted new, or partially used, toiletries. These can be left in the Foodbank basket at Christ the King. Castlerigg Manor, Keswick, 11-13 December. An inspiring weekend away from home and school for Year 10+ and above. Join in, make new friends, enjoy the hospitality of the Manor and prepare for Christmas. More information: 01768-772711 / team@castleriggmanor.co.uk. Red boxes in both sides of the parish are due for collection. At St. Margaret Mary, please bring in for your rep Alison Hather and at Christ the King, to Elaine Dias. On Saturday 12th December at 7.30 pm at St. Margaret Mary’s a concert of Christmas Music [St. Nicholas Mass & Carols]. Tickets £7.50 - school-age children free. Tickets may be obtained by ringing 01228 402012 or 016977746484 and from Judith after the 11.00 Mass on Sundays. Eden Valley Hospice has arranged the following services: Friday 4 December, Carlisle Cathedral Carol Service @ 7.30pm, featuring Kingmoor Junior School & Cathedral Carliol Choir. Sunday 13 December, Hospice Grounds, 4.30 pm, featuring Salvation Army Brass Band and Mike Zeller, BBC Radio Cumbria. www.edenvalleyhospice.org. The Novena of Masses for the Month of the Holy Souls has begun - it is not too late to join deceased members of your family and friends to the intentions of this Novena: simply include their name in the ‘November Dead List’ envelopes and hand to Fr. Michael as soon as possible. Thanks to all who came along on Thursday evening [more than 50 of you] to hear Bishop John Keenan speak about the vocation of the laity. The next Faith on Tap will be on Thursday 19th November when we welcome Fr. Marcus Holden, who will talk about the Catholic Culture of England. Many thanks for your offering of £774.59 last weekend. There were 287 at church over the weekend. There will be an informal meeting for anyone interested in becoming a Catholic on Tuesday 17th November at 7.30 pm in the Presbytery at Christ the King. Castlerigg Manor, Keswick, 11-13 December. An inspiring weekend away from home and school for Year 10+ and above. Join in, make new friends, enjoy the hospitality of the Manor and prepare for Christmas. More information: 01768-772711/ team@castleriggmanor.co.uk. 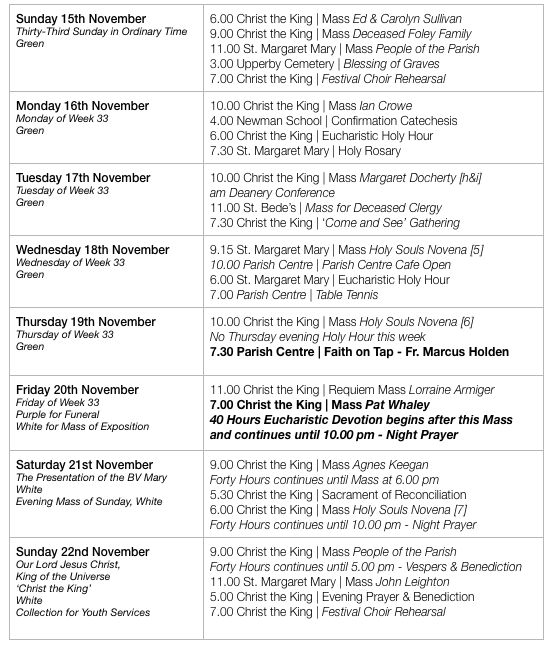 The Forty-Hours devotion will be held at Christ the King during the weekend of 21st-22nd November. Sign up sheets and donation forms for candles are available. Do we go overnight? The annual Blessing of Graves at Upperby Cemetery will be held on Sunday 15th November at 3.00 pm. Next Sunday’s 11.00 am will be a Requiem Mass for the Repose of the Souls of those killed while serving our country in the Armed Forces. Red boxes in both sides of the parish are due for collection. At St. Margaret Mary, please bring in for your rep, Alison Hather, and at Christ the King to Elaine Dias. 11.00 am Mass on Sundays. Eden Valley Hospice has arranged the following services: Friday 4 December, Carlisle Cathedral Carol Service, 7.30 pm, featuring Kingmoor Junior School & Cathedral Carliol Choir. Sunday 13 December, Hospice Grounds, 4.30pm, featuring Salvation Army Brass Band and Mike Zeller, BBC Radio Cumbria. See the poster in the foyer. For more information: Tel: 810801/email care@edenvalleyhospice.org or visit www.edenvalleyhospice.org.